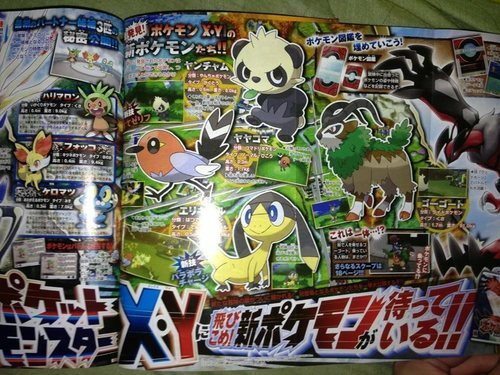 Starting from the top we have Yancham ( ヤンチャム) and is apparently known as the Naughty Pokémon. A Fighting type, the scans tell us that it is 0.6m, 8.0kg (for those of you who are interested and not bemused by the Poképhysics inconsistencies..) and knows a new move called 'Parting Remark' which apparently lowers the users stats (by how much currently unknown) but causes the user to switch out. Next we have Yayakoma (ヤヤコマ) and it is the Japanese Robin Pokémon. A bewildering Normal/Flying type, it can use the move Flame Charge apparently. Don't ask how, it must light it's pokéfarts or something. S/he flies in at 0.3m and 1.7kg. 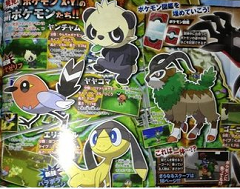 To his/her left is Gogoat (ゴーゴー), the Grass type Riding Pokémon. 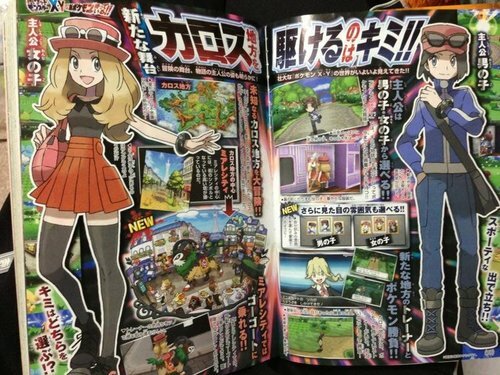 Anew to the Pokémon games, you can actually ride it around town; whether this is exclusive or not remains to be seen. It learns Horn Leech and comes in at 1.7m and 91.0kg. Last and.. probably least, is Elikiteru (エリキテル) who is a Electric/Normal type. Using solar rays to generate electricity (an ability pehaps? 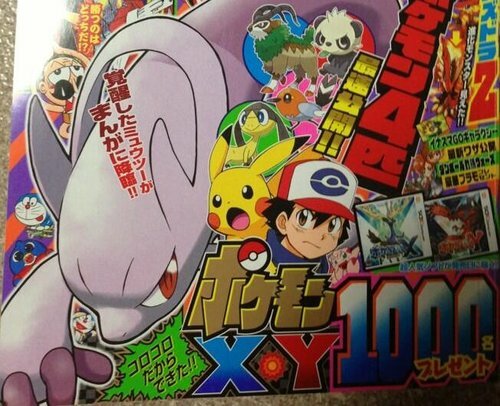 ), it is the Generation Pokémon (who didn't see that coming?) and weights in at just 6.0kg, 0.5m. It has a new move called Parabola Charge which apparently damages the opposition whilst healing yourself, possibly like Giga Drain. The new characters apparently, although we look as blank as ever. I want white hair again.. oh, it's not his hair? Consider me 'mind-blown'.. Unfortunately the Mewtwo Forme still looks like it comes with a user-friendly handle for carrying purposes when purchased or when it's pulling a strop. If only my kids had these attached to them, it'd make it so much easier to kick them away when they're annoying me..
Richard and Blaziken on Wed 15 May 2013 23:40:31 UTC.